Please read our guide for upgrading older versions of Octopus before continuing. Upgrading Octopus 2.0 involves two major steps. Additional information on troubleshooting upgrades is below. Ensure you have a recent database backup that you can restore in case anything goes wrong. 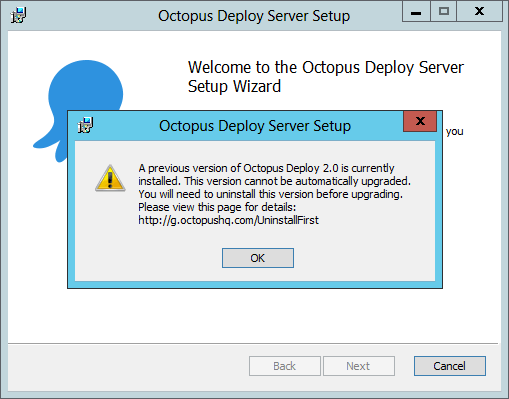 Download the latest Octopus Deploy MSI installer. Run the installer and follow the prompts. If you change the Octopus Server installation path (e.g. C:\Program Files\Octopus Deploy\Server) between upgrades, you will need to reconfigure the Windows service after the installer completes. 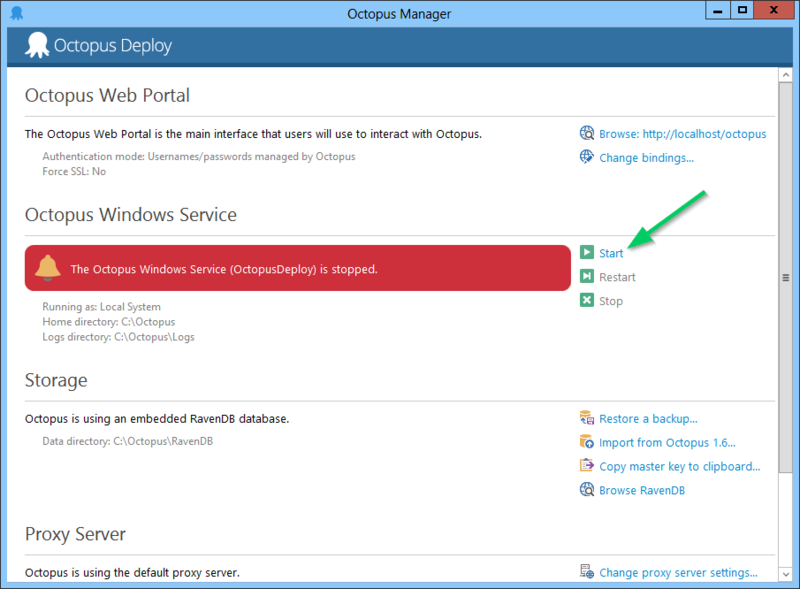 In the Octopus Server Manager, choose the "Reinstall" button to the right of the service status. When the installer finishes, Octopus Manager will appear. Make sure the Octopus service is running by clicking Start. Click on the Upgrade machines button to have Octopus send the new Tentacle package to all of the machines. When Octopus 2.0 was first released, the MSI was set as a "per user" install. This means that if Joe installed Octopus, Mary would not see the start menu entries. For Octopus 2.1, we fixed the MSI and made it a "per machine" installation. However, this created one problem: when you install a new version of Octopus, we normally uninstall the old version. But a "per machine" installation cannot automatically uninstall a "per user" MSI. Uninstalling the old Octopus MSI only removes the program files from disk and stops the Windows Service; your configuration files and the Octopus database will not be touched. When you install the new version, it will continue to work. When upgrading from one version of Octopus to another we actually perform an uninstall of the old version and then install the new version; the only difference in this case is that due to limitations in Windows Installer/WiX, we can't easily locate the per-user installation. After you have uninstalled the old version of Octopus, you can install the new version. And delete the InstallLocation value.